Holy crap this thing is pink. 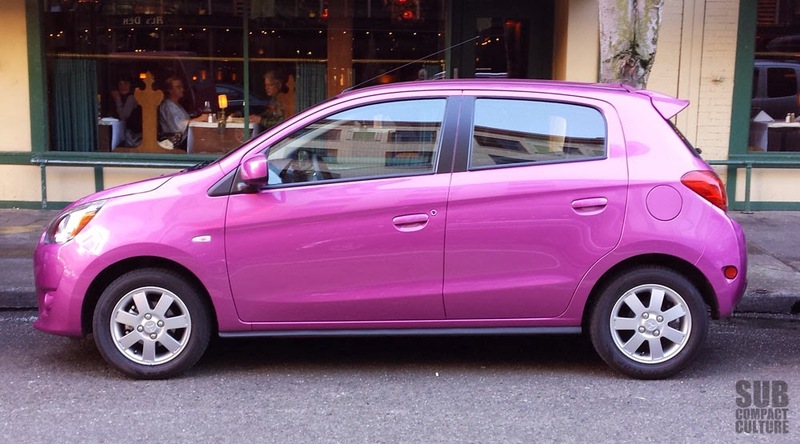 This ultra-bright Mirage is the newest car from Mitsubishi. 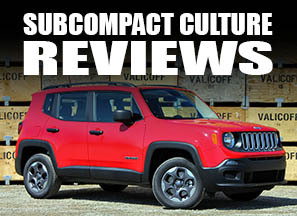 It’s small, rather bland looking, has only 74 horsepower, but it’s rated at 44 highway mpg. In many ways, the Mirage reminds me of a modern-day Geo Metro or an early Kia Rio. Both cars were small, frugal, Spartan, no-frills vehicles that were also available in some gaudy colors. The Mirage hearkens back to a time when economy cars were blatantly economy cars. They didn’t have seat heaters, they had narrow tires, and they weren’t the most refined. Unlike these cars of yesteryear, however, our Mirage came fully loaded with equipment such as cruise control, Bluetooth, power windows and locks, push-button start, air conditioning, fog lamps, and all of the latest modern safety tech. But at its core, it’s still a fairly simple car that’s a bit rough around the edges, but promises very good fuel economy. 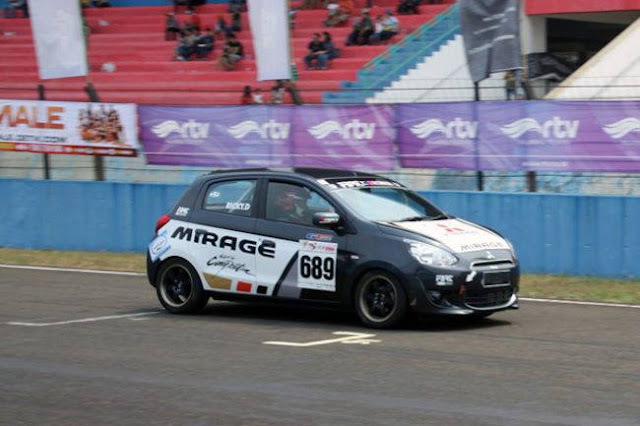 Let’s start with size: The Mirage is 148.8” long—9.2” longer than a Fiat 500 and 4” longer than the Chevrolet Spark. And speaking of the Spark, I’d say it’s the biggest competitor for Mitsubishi’s smallest vehicle, although it’s more refined and stylish. Our tester was not equipped with the touch-screen infotainment, but otherwise is identical to this. Hop in the Mirage and you’ll immediately notice its basic feel. 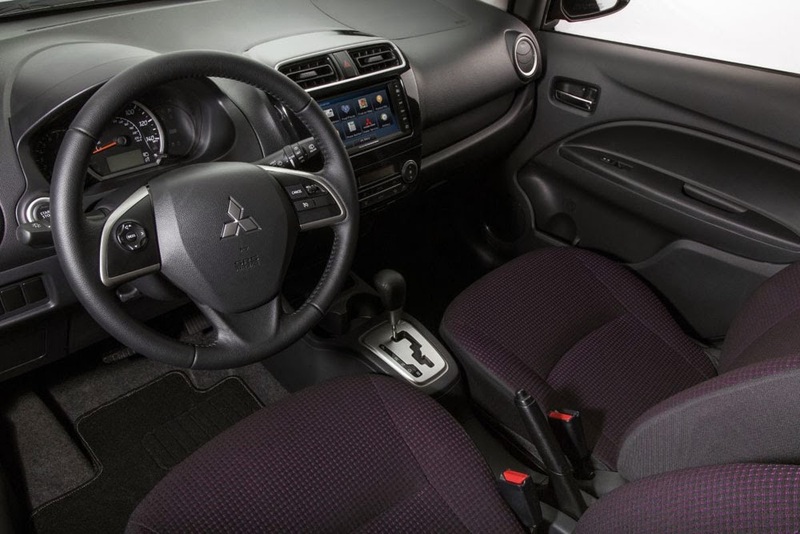 Mitsubishi isn’t trying to push the interior design envelope here like Chevy is with the Spark; it’s not trying to make a statement, unless that statement is “I’m basic.” The build quality isn’t bad, despite the abundance of hard and sometimes budget-feeling materials. 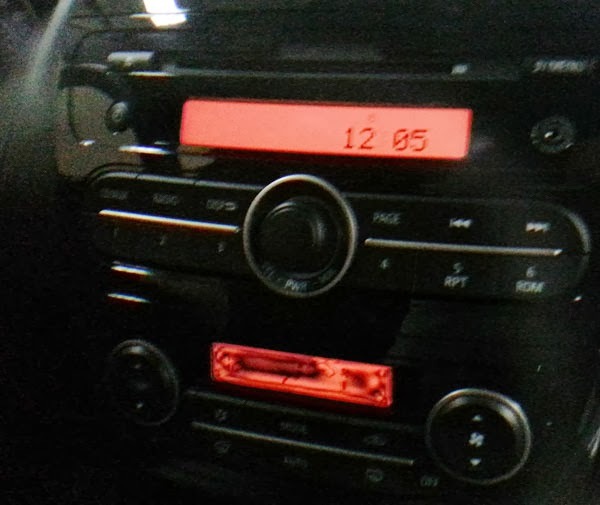 It comes with a basic 140 watt stereo with four speakers and a USB input that comes out of the glove box. The seats are mostly unsupportive, but not uncomfortable, and the upholstery matches the puprleish exterior hue … for better for worse. The gauge cluster has a tachometer and a speedometer, and that’s about it, sans the ECO light that comes on and off depending on driving style. There’s no center arm rest, and while not plush, the car was comfortable enough for what it is. Back seat room is on the small side. As an adult, it’d be fine for shorter jaunts but not a multi-hour trip. And yes, the back seats do fold 60/40. The area behind the seats is also rather small, as expected. Let’s not forget—this is an A-segment vehicle. impossible to see the climate control display. Interestingly, the car has automatic climate control, which works well assuming you can see it. When wearing polarized sunglasses, it's nearly impossible to read the digital display for it. We took a picture through my wife's sunglasses, and you can see what we mean in the picture at the left. Despite all of the bells and whistles that have been added to the Mirage to make it appear modern, fresh, and new, the car feels dated. While other manufacturers are attempting to bring their most basic cars up another level, the Mirage really does feel like a car from the late 1990s in many respects. Certain things are just plain tinny, though. For example, the sun visors. Well actually, not the visors themselves, which are indeed flimsy, but the sound they make when they smack against the headliner when you put them back up. When they slap the roof, it makes a sound like someone just smacked the top of an empty paint can. 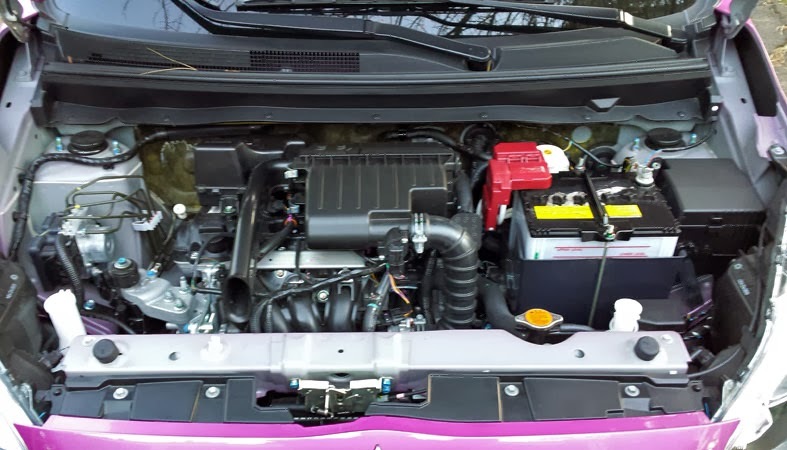 Another area where cost cutting is apparent is in the engine bay, where there is no paint. While it is coated in primer, it isn’t coated in color, unless you count the over spray that came in during the painting process. But guess what? I don’t care if the engine bay is painted or not. But it does send and overall message that this is a budget vehicle. The push-button start on the Mirage is actually on the left-hand side of the dashboard, which drove me nuts, as every single car I’ve ever driven has had the ignition on the right side. Once you find the ignition, the car’s 74 horsepower 1.2-liter three-cylinder engine makes an interesting growl, and once underway, the engine gets more growly and less refined. The sound reminds me of the sound our local US Mail trucks make; a sort of un-tuned industrial snarl. Our Mirage was equipped with the CVT (a manual is available), so there weren’t any gear changes. I will say that when you come to a complete stop with the car in gear, it vibrates a lot—a heck of a lot—to the point where you almost wonder if there’s something wrong with the car. However, there isn’t, as there are plenty of other accounts of the Mirage’s vibrating ways. Some writers have complained about the car’s slow performance. And, admittedly, it’s rather pokey in terms of modern cars. But let’s keep things in perspective. Have you ever owned a 1979 Honda Civic 1200 with an automatic transmission? Now that’s slow. The Mirage is perfectly adequate for what it is, especially in the city. Even accelerating onto the highway is acceptable, albeit very loud. It’s certainly not dangerous, so just keep in mind this isn’t a Lancer EVO or even a regular Lancer. By the way, this car only weighs 1,996 lbs., which does help it get away with so little horsepower. On the highway, the ride is surprisingly decent and that CVT works hard to keep things as fuel-efficient as possible. In fact, at 60 MPH, the engine is only spinning at 2,000 RPM. That’s pretty astounding for a 74 hp car. There’s noticeable wind noise and abundant road noise, but again, this isn’t a Rolls Royce. 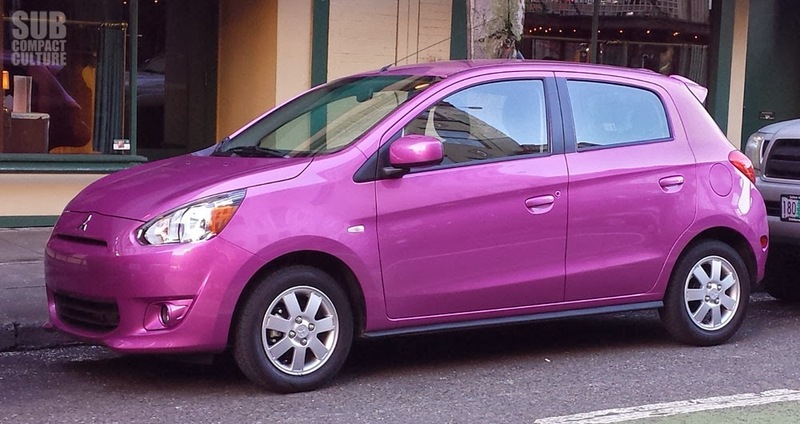 Heck, it isn’t even a Honda Fit. Again, think: modern Geo Metro. The car will easily keep up with traffic and if you can set the cruise control and go, you’ll be rewarded with outstanding fuel economy. I was easily able to get in the mid 40 MPG range on the highway. And even back in town, I was able to get above the 37 MPG city rating. In fact, I’ve read some accounts of Mirage owners easily beating both EPA estimages. Maybe the Mirage is a fuel economy ringer? While fuel economy and highway ride are fortes, handling is not. Firstly, the steering lacks any sort of feel. It kind of reminds me of driving a bumper car—you’re never sure exactly what direction the wheels are going. 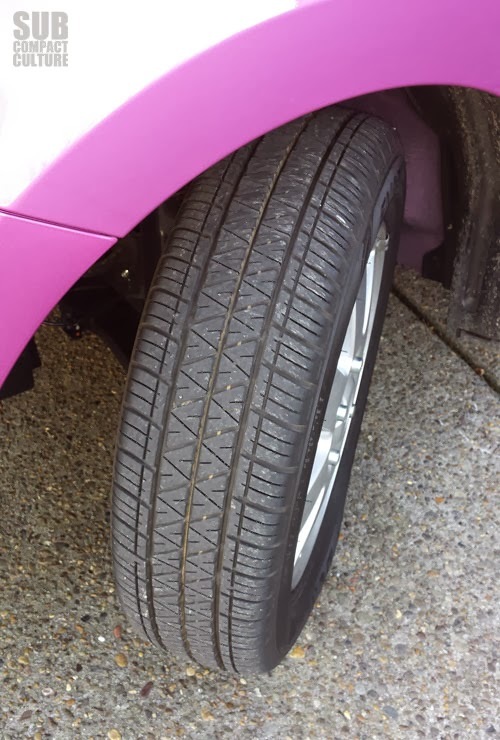 Also not aiding in handling efforts are the Lilliputian 14-inch wheels and extremely narrow 165/65/14 low-rolling resistance tires. Yes, they help fuel economy. Yes, they’re like four spare tires. In addition, there is lots of body roll. Push it into a corner, and it lists like a ship. A very tiny, purple ship. There are times when you feel as if the Thai-built Mirage was intended for developing markets, or places that still offer truly stripped-down cars. While cost cutting can help to keep the overall price down, our Mirage ES stickered at $15,995. That’s slightly less expensive than a similarly equipped Chevrolet Spark 2LT. Keep in mind the Spark also has heated seats, a roof rack, much more progressive styling, and a touchscreen infotainment system. A base model Mirage starts at $12,995, which seems more reasonable. But again, the Spark comes in cheaper at $12,170. The Spark doesn’t quite get the mileage the Mirage is estimated at, so perhaps that will sway buyers into Mitsubishi dealers. Despite its Spartan feel and not so noteworthy driving dynamics, there is an honest, simple quality to the Mirage. It’s kind of like finding a pair of inexpensive jeans that fit well. They’re basic, they’re blue, they fit, and they’ll probably last a while, too. 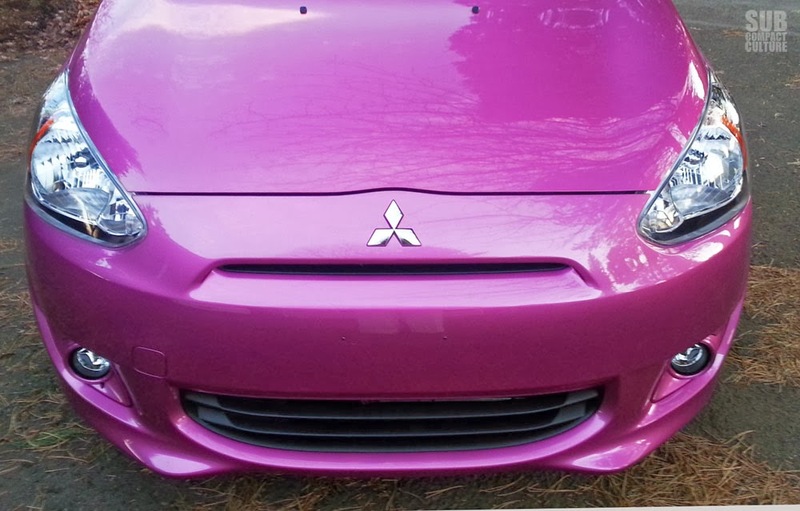 And you know, you can always dye them hot pink to make them more noticeable, sort of like Mitsubishi did with our test vehicle. The Mirage’s secret weapon, and possible key to sales success, will likely be its fuel economy numbers, which best all other gas-powered cars sold in the U.S. Pair this with its low price and available features, and for many people, the Mirage might be more attractive than other subcompacts. But those who value driving dynamics and modern looks will go elsewhere. 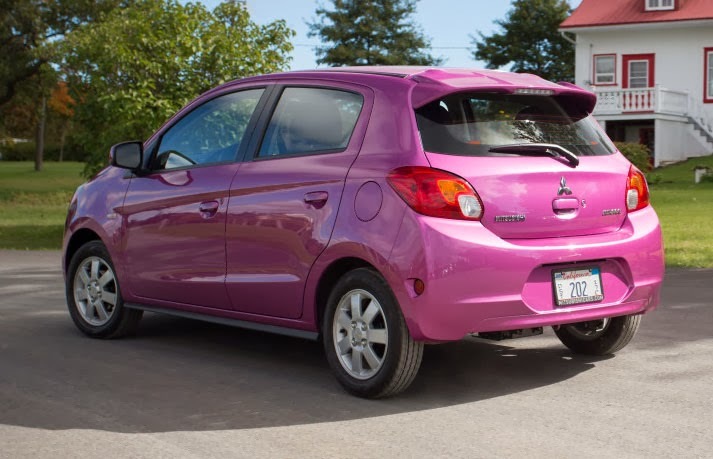 Chevrolet’s Spark was an unexpected hit, and it’ll be interesting to see if Mitsubishi will take some of the fire out of the Spark’s sales, or if it’s destined to be a slow seller. One thing is for sure—you’ll get great fuel economy, and you’ll burn your retinas out if you stare at this Plasma Purple hue too long. Okay first off who did you piss off on the PR Team or Fleet Service at Mitsubishi? I mean this stuff just doesn't happen on accident. Second if you had a choice in color what would you go for? As for the Mirage itself, I sat in one at the LA Autoshow and instantly though of the first gen Yaris in the US. Just super basic but I think for what the car is the Mirage totally makes sense. I just wish we had the Colt and not this. You hit the high & low points about the car without freaking out & obsessing about acceleration & handling, as many reviewers seem to do (those who are measuring the car with the wrong measuring stick). That said, some owners *are* opting to fit aftermarket suspension upgrades to tighten up handling. A rear sway bar is a cheap & easy fix. Too bad you didn't also get to try the 5-speed. More fun! And the CVT, while surprisingly efficient, always generates the "loud engine" complaint: you stand on the go pedal, the little motor spools up to peak power RPM and hangs there yelling at you while the car accelerates. You don't get that with the 5MT (and it's faster). I'm surprised you didn't link back to your Mirage vs. Metro comparison, since you mentioned the old Geo a few times.